Washington, a Chicago native, will receive the Academy’s esteemed Abraham Lincoln Civic Engagement Award, on behalf of SIUE, during the 43rd Annual Student Laureate Award Ceremony being held Saturday, Nov. 11 in Springfield. Washington’s desire to become a leader and make a difference was formed at a young age. She is committed to positively impacting and changing lives in all she does. While at SIUE, along with achieving academic excellence, Washington has worked in five different departments across campus, and served on four executive boards and 10 organizations or committees. 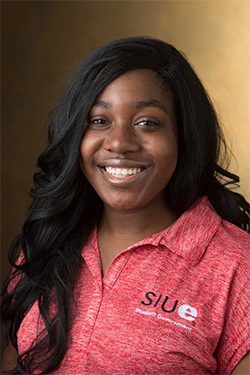 She is president of the student organization Black Girls Rock!, an SIUE honors student, a member and diversity officer in the SIUE Student Senate and a Springboard to Success orientation leader. According to Washington, her career aspirations “change with the weather,” but her pursuit of a degree in secondary English education is setting her in a good direction. “I have always been goal-oriented and extremely organized in my values, but attending SIUE has given me all of the missing networking and leadership-oriented pieces I was missing to make my dreams realistic and measurable to achieve,” Washington concluded. Photo: SIUE’s Keelah Washington, a senior English major with a concentration in secondary English language arts.